If you weren't a huge baseball fan and were just following the NLCS from reading columns online, you'd immediately come to one conclusion: that the Cardinals are doing everything right and deserve to be canonized, while the Dodgers are one step away from smashing every Cardinal in the kneecap with a baseball bat and laughing at them as they twitch in pain. I'm not even being too hyperbolic with my statements. The narrative being written has nothing to do with Clayton Kershaw, Zack Greinke, Adam Wainwright, Michael Wacha, or any of the other players on the field, but instead the perceived differences in the way those players play the game. There's also yet another narrative being beaten to death about the best fans in baseball, while Dodgers fans are puppets that don't even know what a checked swing is. Deadspin has done the yeoman's work in beating the narrative to death, making the apt comparison to Cardinals fans to Duke fans with no self-awareness. This is an actual section of an actual column from professional troll and St Louis cheerleader Joe Strauss. Hey, baseball is the primary religion in Our Town. Out here it’s a place to be seen, maybe flash some gang signs on the matrix and bat a beach ball. (The series became official when one went onto the outfield in the seventh inning.) The Dodgers reflect the culture, albeit with a Wednesday timeout for shortstop Hanley Ramirez to punish an offending water cooler. The Cardinals boast about the “best fans in baseball.” The Dodgers prefer to boast of the coolest ones. Something’s got to give. Quick thought: maybe baseball is the primary religion in St Louis because there's nothing else to do. But I digress. Strauss is essentially trying to make the same point that those ever-so-annoying people on Twitter love to spout off when someone dares tweet about football in September: "IT'S STILL BASEBALL SEASON!" God forbid you have multiple interests and worship at the altar of baseball, right? Oh no, Los Angeles fans smack beach balls around! They're disrespecting the game! Give me a break. Going to a baseball game is about having a good time, so who really cares what you do to have a fun? Strauss also went after Yasiel Puig for no real reason, just because he can. The Cardinals reminded their players of the relevance of Stan Musial during spring training. 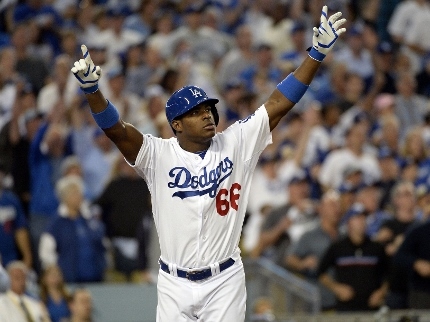 Puig may not yet fully appreciate Jackie Robinson, Sandy Koufax or the legend of Kirk Gibson. He does appear infatuated with his own talent, which can be good and bad for his team and extremely irritating to the one across the field. The legend of Kirk Gibson has been reduced to a manager on a division rival who got offended that the Dodgers celebrated in the pool at Chase Field, for what it's worth. And I'd like to think that Puig appreciates Robinson and Koufax, considering he wouldn't be playing in the majors if it weren't for Robinson and that Koufax has made numerous appearances at Dodger Stadium and in Spring Training this year for the Dodgers. I'd be willing to say this is worse than the Arizona writers who were upset that Puig didn't kiss Luis Gonzalez's feet this year, just because it's assuming that he's ignorant of the history of baseball as opposed to the history of one neophyte franchise. But hey, that's not all for the manufactured storylines! Bob Nightengale of USA Today (who used to be a really good reporter once upon a time) wrote a story where he interviewed Stan Musial's grandson. 32-year old Brian Schwarze was terrified about fans (get this) throwing popcorn at him and his friends and trying to trip him going up the aisle. He then invoked the name of Bob Gibson (whose career was over before he was born, by the way), saying that Gibson would have tackled Puig on the basepaths for his antics. That and throwing at hitters' heads (another Gibson specialty) is apparently "old-time baseball" and indicative of baseball being a "gentleman's game". Remember a few weeks ago, when the narrative had shifted against the Atlanta Braves for being the policemen of MLB? Now, the narrative has shifted to laud the Cardinals…for essentially the same thing. This has gotten ridiculous. It''s almost as if these old baseball writers don't understand that while the sport isn't *dying*, it's losing its grip on the casual fan. What better way to further alienate that casual fanbase than to insinuate that the players aren't allowed to have fun on the field and that at the ballpark, you can't do anything aside from watch the game or you're a bad fan that doesn't appreciate the game?